The Concerti Grossi, Op. 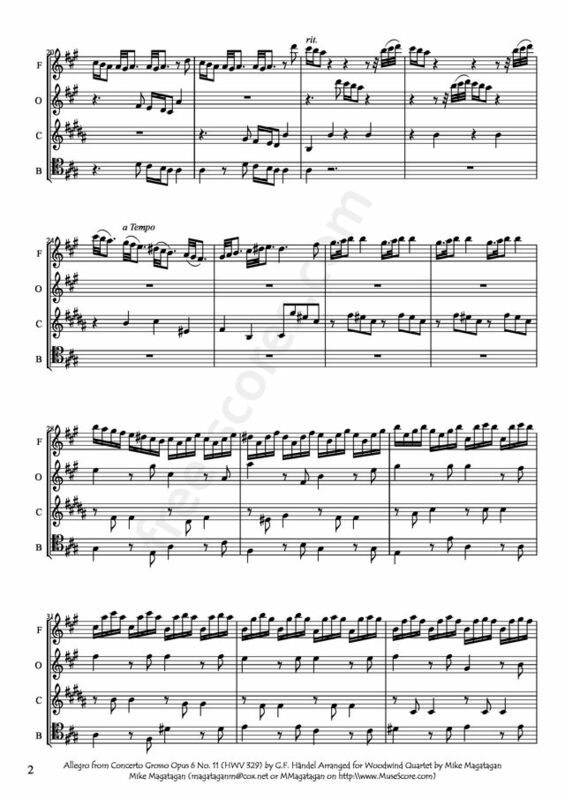 6, or Twelve Grand Concertos, HWV 319–330, are 12 concerti grossi by George Frideric Handel for a concertino trio of two violins and violoncello and a ripieno four-part string orchestra with harpsichord continuo. First published by subscription in London by John Walsh in 1739, in the second edition of 1741 they became Handel's Opus 6. Taking the older concerto da chiesa and concerto da camera of Arcangelo Corelli as models, rather than the later three-movement Venetian concerto of Antonio Vivaldi favoured by Johann Sebastian Bach, they were written to be played during performances of Handel's oratorios and odes. Despite the conventional model, Handel incorporated in the movements the full range of his compositional styles, including trio sonatas, operatic arias, French overtures, Italian sinfonias, airs, fugues, themes and variations and a variety of dances. The concertos were largely composed of new material: they are amongst the finest examples in the genre of baroque concerto grosso. The eleventh concerto was probably the last to be completed according to the date in the autograph manuscript. Handel chose to make this concerto an adaptation of his recently composed but still unpublished organ concerto HWV 296 in A major: in either form it has been ranked as one of the very finest of Handel's concertos, "a monument of sanity and undemonstrative sense", according to Basil Lam. The concerto grosso is more carefully worked out, with an independent viola part and modifications to accommodate the string soloists. The ad libitum sections for organ are replaced by accompanied passages for solo violin. The order of the third and fourth movements was reversed so that the long andante became the central movement in the concerto grosso. The final allegro is an ingenious instrumental version of a da capo aria, with a middle section in the relative minor key, F sharp minor. 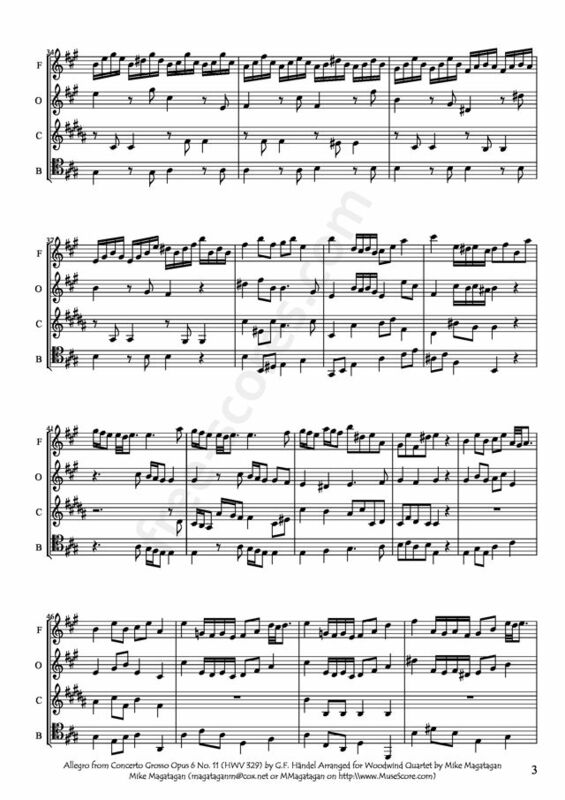 It incorporates the features of a Venetian conerto: the brilliant virtuosic episodes for solo violin alternate with the four-bar orchestral ritornello, which Handel varies on each reprise. 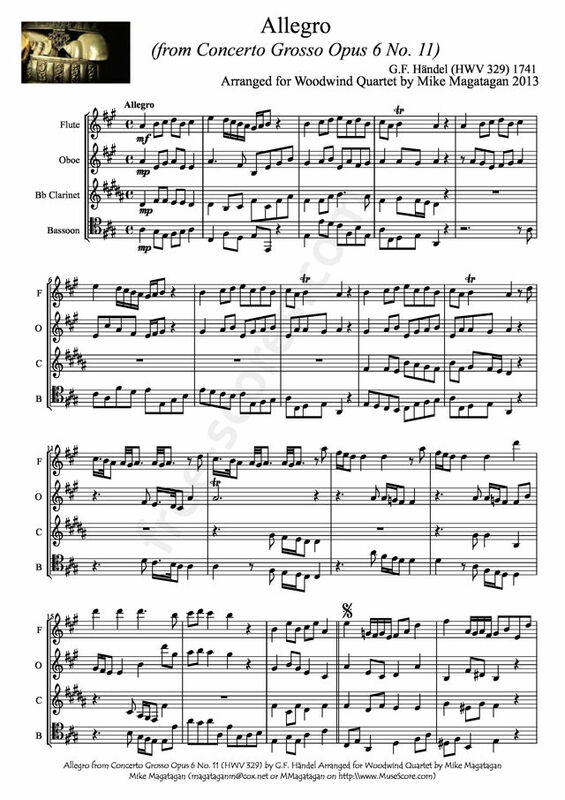 Although originally written for a small String Chamber orchestra, I created this arrangement for Woodwind Quartet (Flute, Oboe, Bb Clarinet and Bassoon). All duet flute and guitar sheet music books.